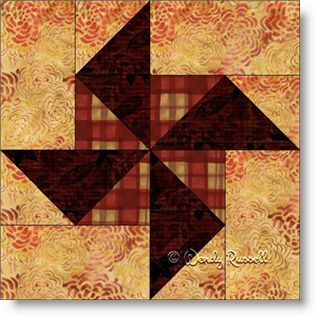 If I was choosing a name for this four patch quilt block I likely would have used the word Pinwheel in the name. However, this block is called Fan, and I suppose that is correct too, as a pinwheel or a fan would both generate a breeze. So enough of my musings. This quilt block is a great starter block, for those who are just beginning their quiltmaking journey. The block introduces you to the flying geese unit, a frequent patch in quilt blocks. I have provided instructions for making several different sizes of this quilt block. The sample quilts illustrated give you some general ideas on laying out the blocks to make your quilt.